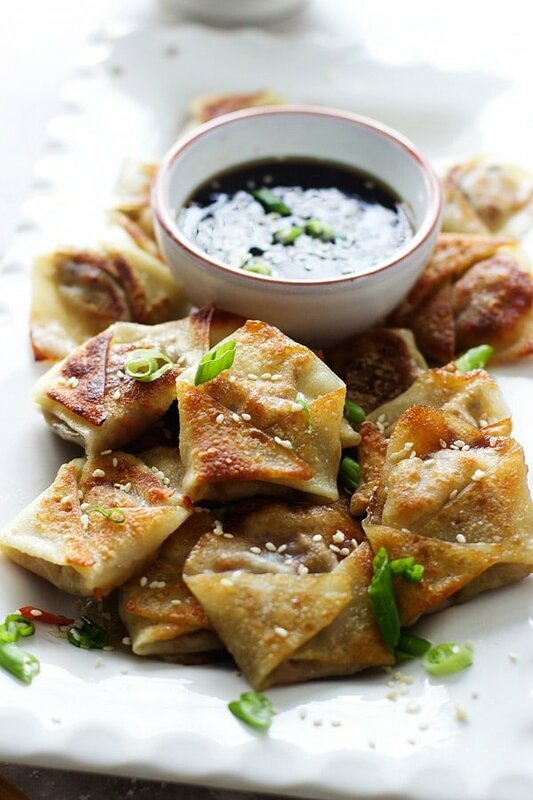 These Easy Asian Dumplings with Hoisin Dipping Sauce are one of our favorite appetizers to serve a crowd. 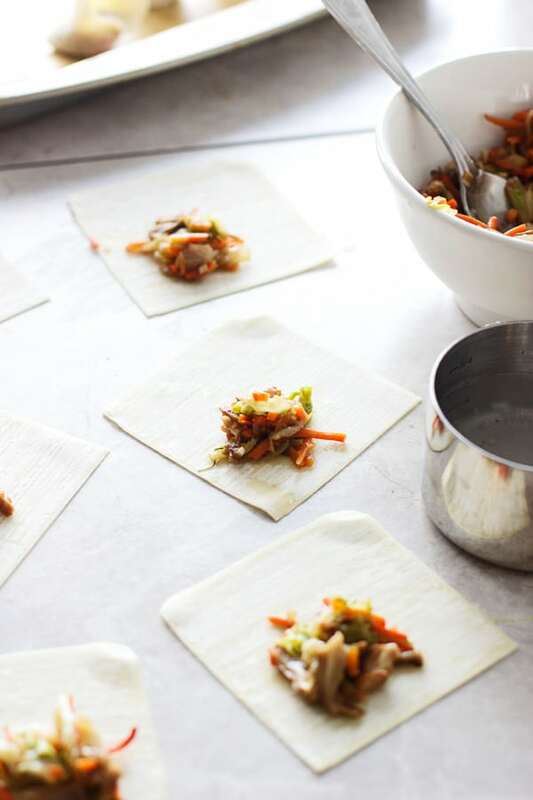 The filling is packed with salty cabbage, crisp carrots and shiitake mushrooms, then stuffed into wonton wrappers and pan-fried. They’re delicious and completely addictive! Apparently I have a thing for easy Asian appetizers, so be sure to check out these Banh Mi Wonton Tacos, these Roasted Shishito Peppers with Soy Glaze, , and these Peanut Chicken and Veggie Lettuce Wraps. Greetings from Puerto Vallarta, Mexico! I had every intention of drafting up my posts for this week prior to leaving for our beach vacation on Saturday, but as it often does, time slipped away from me. Before I knew it, it was Friday morning and I still had a list a mile long to finish before our 8am departure the next day. Although, I’m not going to lie, it’s not the least bit torturous working on vacation. As I type, I’m sitting under a giant palapa, gazing out to the ocean and watching the orange, now pink sun slowly sink down behind the mountaintops just across the bay. Oh, and I’m also sipping on an ice-cold Pacifico. It’s quite glorious. 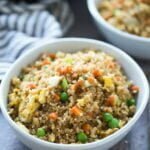 I find it pretty ironic that I’m sitting here stuffing my face with copious amounts of chips, guac and everything Mexican, and this week I’m going the completely opposite direction and sharing two Asian-inspired recipes. Go figure. I was actually going to hold off and share these another week, but I plan on recreating pretty much every meal we’ve had thus far for the blog in subsequent weeks, so I thought you might get a little sick of repetitive Mexican recipes. Unless you’re like me and could inhale Mexican at any given moment, in which case, I’m sorry. 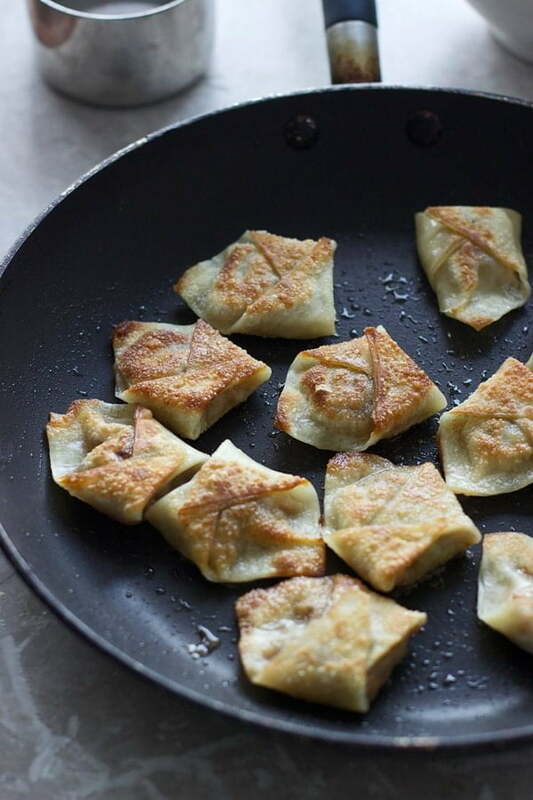 I’m pretty much obsessed with these little pot stickers. Or dumplings. Or gyoza. Whatever you want to call them. Clearly I don’t even really know what to call these little bites in order to make the name “politically correct,” so to speak. Obviously I’m not entirely sure these are 100% authentic, but goshdarnit, they are good. And the best part? They’re relatively easy (and fast!) to make. Sliced shiitake mushrooms, because they’re the best of all the mushrooms, in my opinion. And napa cabbage. Because what’s a veggie dumpling without a little bit of cabbage. Each component of the filling is chopped up, sautéed in a screaming hot skillet with a clove (or two) of garlic, a little bit of sesame oil, sriracha and soy sauce. Once the veggies are wilted, the filling is set aside to cool. I had every intention of following a how-to video and shaping each dumping all perfect and cute, and I actually did try…several times… and they did NOT look pretty…at all. So, I did the next best thing and folded them as cute as my non-existent dumpling making skills would allow. Here’s what I did. Place one heaping teaspoon of filling on the corner of wonton wrapper. Using water, wet the sides of the wrapper. Fold corner over to form a triangle. Seal edges, making sure there are no air bubbles. Fold corers over each other, use water to seal. Repeat for remaining filling. Easy. Once all the little guys are made, I heat a large non-stick pan with a touch of olive oil, and brown the dumplings in batches until they’re golden and crispy on both sides. To finish cooking them, a quarter cup or so of water is added in, they’re covered and then steamed until the water has dissipated. And just like that – dumplings are ready to be devoured. I serve them with an insanely quick dipping sauce made up of sweet hoisin sauce, sirracha, sesame oil and a touch of soy sauce. A sprinkling of sesame seeds and chopped green onion finish this easy-on-the-eyes appetizer. 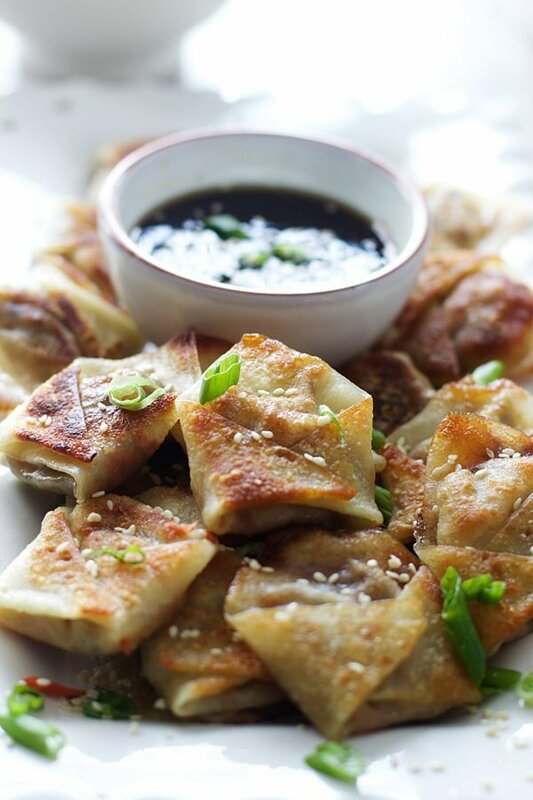 These Easy Asian Dumplings with Hoisin Dipping Sauce are one of our favorite appetizers to serve a crowd. 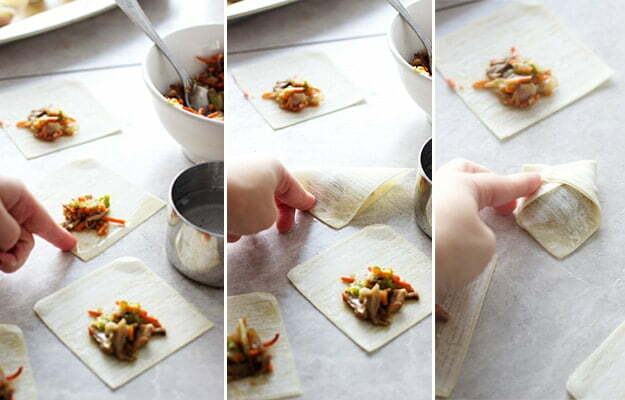 The filling is packed with salty cabbage, crisp carrots and shiitake mushrooms, then stuffed into wonton wrappers and pan-fried. They're delicious and completely addictive! 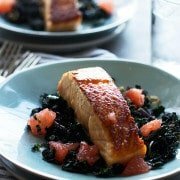 In a large non-stick skillet, heat 1 tablespoon sesame oil over a medium-high heat. Add carrots, mushrooms, cabbage and garlic. Saute 2-3 minutes until veggies start to wilt. Add soy sauce, sirracha and hoisin. Once veggies are completely cooked, set aside to cool. For assembly: Place one heaping teaspoon of filling on the corner of wonton wrapper. Using water, wet the sides of the wrapper. Fold corner over to form a triangle. Seal edges, making sure there are no air bubbles. Fold corers over each other, use water to seal. Repeat for remaining filling. Working in two batches, heat a large non-stick skillet to a medium-high heat. Add 1 tablespoon of olive oil. Add dumplings, brown on both sides until crispy and golden. Once brown on both sides, add ¼ cup of water. Cover and let set until water has evaporated, about 30 seconds to 1 minutes. Repeat with remaining batch. 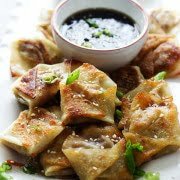 Serve dumplings with sauce and garnish with sesame seeds and green onion. Add all ingredients to a small bowl, stir to combine. Serve! 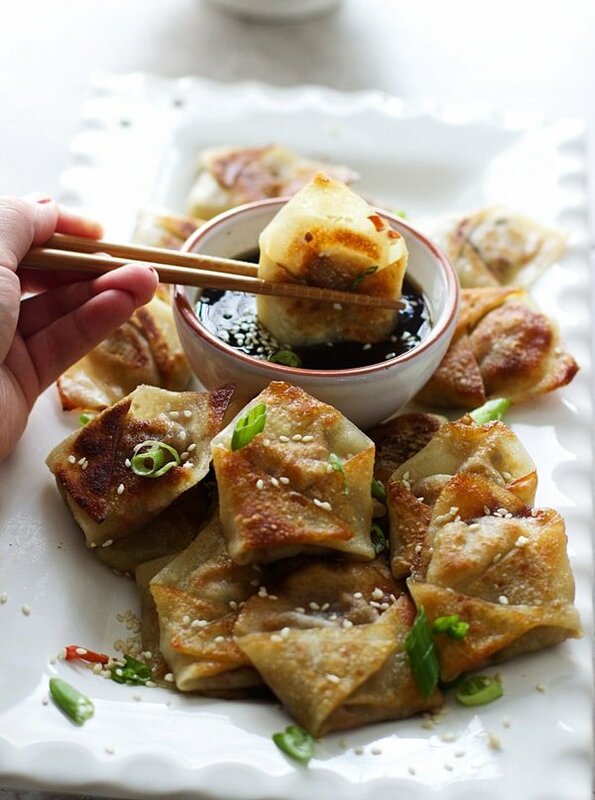 54 Responses to "Easy Asian Dumplings with Hoisin Dipping Sauce"
Dumplings for dummies, ha! I love it. And NEVER ever apologize for posting Asian or Mexican food recipes, as those are basically my only two food groups. And within those categories, dumplings are a major component. Can’t wait to try these! It’s so true! Anyone can make these! Thanks girl! Oh yum Nicole, and if it’s for dummies, I think I can handle it. You’re in Mexico?! NICE! I am totally jealous girlfriend! mexico?? I am so jealous, as I type this its snowing outside 🙁 These look super yummy, I love the quick assembly. Pinned! Ughhhhh I’m pretending I don’t have below ten degree weather and snow to come home to…. Thanks Ashley! I am dying over how amazing these look! What a simple recipe. Must try! Dumplings for dummies haha that’s definitively me!! I’ve never made dumplings and this post convinced me I can do it 🙂 I hope you are having an absolute blast in Mexico and soaking in lots of sun! You CAN!!!!! If I can you can. Thank love! Okay, first of all, my mouth is watering like crazy over these dumplings! They look so good. Second, you can post all of the Mexican recipes you want because I’m like you, I can inhale it any and every day of the week. Third, I am so jealous of your vacay! Take me with you!! 🙂 Really though, keep rubbing my face in it on IG. I love it! I know, right?! Sorry, I can’t resist! The food NEEDS to be share! Mexico?! Oh man, I would kill for some sun and warmth right now. Enjoy your vacation. I’ll be here sitting in my parka eating these dumplings. BAH you’re in mexico and it’s freezing and womp womp, I am jelly. Throw back a frozen marg for me, will ya? In the meantime I’ll be drooling over these dumpling, SO adorable! Sounds like you are having a great vacation. These dumplings are absolutely adorable. Fabulous idea. Thanks. I sit here in jealousy, bundled up in my sweater, as you frolic on the beaches in Mexico. What a fun time. I’m always a sucker for a good dumpling and these look quite tasty. Even better that they are easy to make. Shall we say game night? Sorry!!! I know how you feel, I’ll be there in t-minus three days! Also a sucker for a good dumpling, especially an easy one! You HAVE to Medha! 100% easy and SO good! I am so jealous that you are on vacation 🙂 But you can make it up to me by most definitely recreating all that food you’ve been posting on instagram! Bring on the mexican! In the mean time I’ll happily eat these dumpings! They look fantastic! Ohhhhhhhh I will!!!!!! Thanks my love! Drooled my way over here from Foodgawker. It looked delicious but I wanted to see what all was in it. All of it sounds delicious! Love crispy dumplings. Thanks Farah!!! And thank you for coming by!! Thanks Farah!!! And thanks for coming by!! These look delish! I saw them when you posted them on instagram and just now the pic popped up on my foodgawker feed…I think these dumplings are stalking me, begging me to make them! I want to zap myself into your vacation! Have an extra margarita for me. These are just the cutest little dumplings ever! 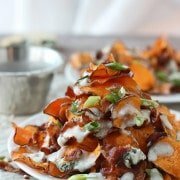 I can only imagine how addictive and moorish they must be Nicole.. great recipe! I can’t wait to make these. I’m a dumpling fanatic!! Do you know if these will freeze/reheat well? Well, I actually made a giant batch of these, then stuck them in the fridge and popped them into and 375 degree oven to crisp up. They were still just as good! I wouldn’t recommend doing it much further ahead though. You could also try freezing them right after assembling them, but I can’t attest to how they would turn out. Hope that helps! You’re in Mexico right now?? SO jealous!!! I gotta get to Mexico one of these days. CANNOT wait to hear all about everything you ate… so get going recreating your fave recipes from your trip. I need Mexican food in my face ASAP… well, after I make these. And I’m with you. I totally can’t wrap a wonton either. 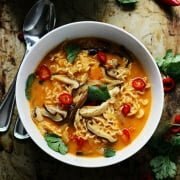 These look so tasty, and are dinner tonight!! I’ve made several dumplings/pot stickers in my day. One of the steaming methods I do is chicken broth, instead of water. Just adds some extra flavor. Cant wait for dinner! Thanks so much! Ooo that’s a great tip Jackie!! I have to try that next time! …I don’t care what you call them, they are really good! 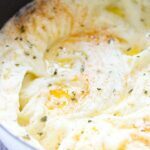 I cut the recipe in half as it was just my husband and I. I was wondering if you could make a batch and freeze what you do not cook. Glad you liked them Denise!! I absolutely think you can make a batch and freeze them! Just pop them into a 375 degree oven until them crisp up again! 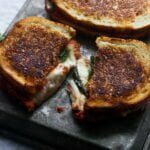 I made these last night and they were amazing! They are bursting with flavor! I couldn’t find nappa cabbage at the market so I had to settle for shredded romaine instead. I can’t wait to make these for my next family function! They are veggie dumplings Frank! 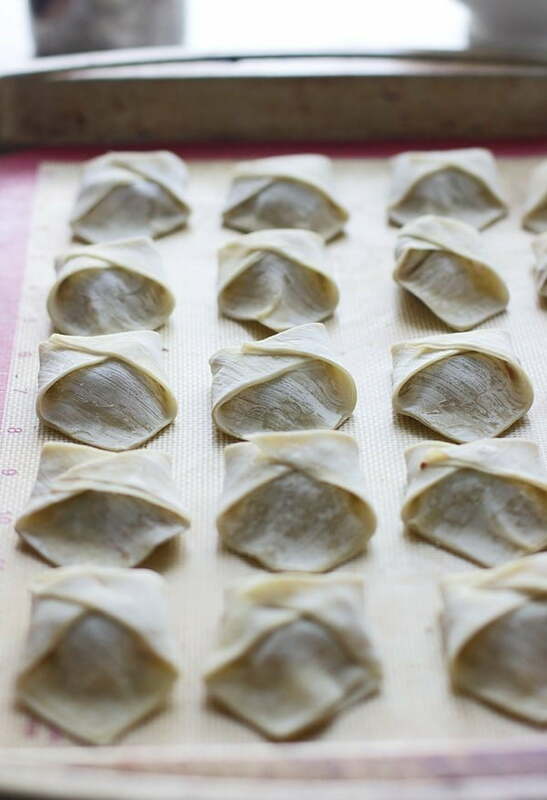 A friendly hello from Canton China~Since you made these dumplings in wonton wrappers, you can call them wonton. Anyway, we’ve always wrap our wontons in a traditional way, but your peculiar approach really is an amazing twist! I am inspired by the way you wrap them up and I will definitely try it. Good job for your creative inspiration on our traditional home-made food. Thanks a lot! Thanks for the kind words Ginny!